There were no minutes to adopt. 1 That the information in the report concerning council owned land – available, developable land stocks, including unsold blocks be received. 2 That Council close the section of unused road reservation on the corner of Hyland Park Road and Mann Street and incorporate the land into the proposed Lot 14 in Council’s approved subdivision. 3 That Council’s seal be attached to any documents relating to the road closure, the creation of a title and the incorporation of the land into the proposed Lot 14 in Council’s subdivision. 4 That Council obtain an assessment of the current market value of the land at Hyland Park and Valla Beach. 5 That Council investigate alternate flood free areas for the development of commercial and residential areas at Macksville. There being no further business the Mayor then closed the meeting the time being 5.20 pm. The report covers Council’s industrial and residential land holdings. It provides a status report on pending and proposed actions. The report also identifies the potential profit to be gained from the development and sale of residential lots from Council’s approved residential subdivision in Hyland Park. 2 That Council’s seal be attached to any documents relating to the sale of Lot 2 DP 1197777 being Council’s industrial land parcel in Yarrawonga Street, Macksville. 3 That Council’s seal be attached to any documents relating to the leasing and sale of proposed Lot 11 DP 1197778 being Council’s industrial land parcel in Railway Road, Nambucca Heads. 4 That council support the preparation of a tender for the development of the 13 lot residential subdivision in Hyland Park with the lots to be sold “off the plan” prior to starting the subdivision civil works. The report identifies two parcels of industrial land being prepared for sale being proposed Lot 11 in Railway Road, Nambucca Heads and Lot 2 Yarrawonga Street, Macksville. Council has resolved to accept an offer from the Precision Placement Group Pty Ltd to purchase the proposed lot 11 in its undeveloped state for $245,000. Council has also resolved to lease the land to the Precision Placement Group for $425 per week pending settlement. Therefore there are no real options in relation to this land. The land in Yarrawonga Street is ready to go to market and it is anticipated that by the time of this meeting that Council will have a valuation so that it will be able to fix a price for the land and a negotiation range for its sale. The report proposes that the preparation work including the design and layout of the Hyland Park subdivision be completed to prepare to tender the construction and project management. The alternative options for the land in Hyland Park are either to defer its development to a later time or to sell the land “englobo” to a developer and for them to undertake its development and sale. The last option to sell the land “englobo” has been considered but given that Council owns the land with no finance and has obtained development consent, it is difficult to understand how the Council would achieve a higher return by selling it “englobo”. The major difference between the two options relates to risk, and in this regard it is recommended that Council sell “off the plan” prior to committing to the civil works. This report provides an update on resolution no. 1 and also addresses the Hyland Park land referred to in resolution no. 4. 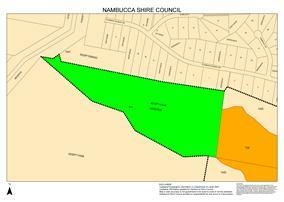 Council owns an approved but undeveloped and unregistered 4 lot subdivision in Railway Road, Nambucca Heads. A locality plan showing the land is attached. The parcel has a total area of 2.65 hectares. A plan showing the approved subdivision is attached. Council has resolved to accept an offer from the Precision Placement Group Pty Ltd to purchase the proposed lot 11 (the lot closest to the railway station) in its undeveloped state for $245,000. The land has an area of 4,450 square metres. Council has also resolved to lease the land to the Precision Placement Group for $425 per week pending settlement. The proposal is to have a contract which requires the purchasers to undertake the civil works to satisfy the conditions of consent and allow the subdivision to be registered. The required civil works include the provision of road shoulder seal, kerb and gutter, interallotment drainage, sewer and water connections, the provision of an electricity connection and retaining walls as necessary. Contributions are also required for water and sewer being $4,860 for water and $4,506 for sewerage. There are also plan lodgement fees to Council and the Registrar General. At the date of preparing this report, the purchasers were awaiting the determination of their development application for the use of the land. The period for adjoining owner notification does not conclude until 18 July 2014. · An electrical designer has been engaged to provide the required design for the whole subdivision to be connected to the Essential Energy network. This includes the installation of a sewerage pumping station. The design will allow for accurate quoting and installation approvals by Essential Energy. · A geotechnical report has been obtained for the entire subdivision as per a condition of development consent. This was a pre-requisite for civil earth works. An application made to NSW Trade and Investment to provide financial assistance for the development of the Nambucca Industrial site was refused. In selling lot 11 undeveloped at the agreed price of $245,000, Council has the opportunity to generate the funds to provide power, water and Telstra infrastructure to all three IN1 lots (Lots 11, 12 and 13) at minimal additional cost. Estimated development costs for the other two IN1 lots being 8,660 m2 are $40 per m2 or $345,000. The remaining 11,830 m2 of B7 zoned land is the fourth lot in the subdivision. Its estimated undeveloped value is 11,830 m2 x $55.5 per m2 = $656,565. Its estimated developed value is 11,830m2 x $75.00 per m2 = $887,250. There was a report to Council’s meeting on 27 March concerning the creation of an industrial lot in Yarrawonga Street. A plan showing the subdivision is attached. The subdivision is now approved with Lot 1 (zoned IN2 Light Industrial) having an area of 2,497m2 and Lot 2 (zoned RE1 Public Recreation) having an area of 1,085m2. A valuation for the land is being sort with the intention of selling Lot 1. It is anticipated that a valuation will be available for consideration by this meeting so that Council may fix a listing price and negotiating range. The only work required to achieve registration of the plan is the provision of water and sewer connections as well as connections to electricity and telecommunications. The arrangements for these works to be done are underway. Council has an approved 13 lot subdivision for land it owns in Hyland Park. A locality plan showing the site is attached. In 2010 Council staff obtained a proposal from Hopkins Consultants for design services as well as an estimate of development costs. A copy of that proposal is attached. Recently the State Government announced that land development activities being undertaken by Councils with borrowed funds would be eligible for an interest rebate of 3% under the Local Infrastructure Renewal Scheme (LIRS) funding program. The LIRS program is based on the repayment of principal and interest over a term of not more than 10 years. With interest rates at historic lows and a 3% rebate being available, the holding costs using finance to undertake the subdivision are very low. With this attractive financing option some consideration has been given to undertaking the Hyland Park residential subdivision. However there are other matters which weigh towards Council continuing to defer the development of the land. A significant factor is that recent modelling undertaken by the Assistant General Manager Corporate Services, suggests that Council cannot continue to support so much of its capital works program with borrowed funds and that the commitment of finance to the Hyland Park project may be at the expense of its capital works program. This issue may not be significant if the subdivision could be completed and sold within a relatively short period. When previously discussed by Council staff there was not a high level of confidence that Council would receive a reasonable return within a reasonable period and notwithstanding the availability of LIRS funding it would be better deferred to a period when property prices were stronger. In this respect it was believed that with continuing low interest rates, property prices at Hyland Park should show some improvement following the completion of the Nambucca Heads to Urunga Pacific Highway upgrade. The consensus was that the development should remain on hold however over the past month the Manager Business Development has been contacted by local Nambucca Heads Real Estates asking when the Hyland Park subdivision will be developed. The Manager Business Development recommends that council finalise the civil works design for the subdivision with the intention to “sell off the plan”. A tender for construction would be undertaken later in 2014/15 and with actual construction occurring in the 2015/2016 financial year. It is proposed that Council undertake the construction with borrowed funds using the LIRS subsidy, but with a short term loan facility that would see the loan discharged as soon as sufficient lots were sold. At Council’s meeting on 22 May 2014 it was resolved that Council obtain a current market value of the land at Hyland Park. The valuation attached to the land in the general revaluation with a base date of 1 July 2013 was ???? If Council seeks a valuation from a registered valuer it will cost between $1,100 and $1,500 and without a detailed breakdown of likely development costs it cannot be definitive as to the likely return to Council from the subdivision of the land. The development and sale of industrial will assist with social wellbeing of the community via employment creation. Council has a reasonable stock of vacant land which it can use to improve economic outcomes. The report is for information. There are risks involved with all property development however all of these land development projects are producing land for sale based on covering development cost without extended borrowings. There has been about a day’s work required in compiling the information and writing the report. The report proposes that Council reclassify and subdivide the “vacant” land to the west of the Valla Beach Pre-School car park with the intention of investing the proceeds in providing improved facilities in Valla Beach. The identification of projects in Valla Beach to benefit from the proceeds would be undertaken in consultation with the Valla Beach Community Association, which is the Section 355 Committee responsible for the Hall and Pre-School. 1 That Council give public notice of its intention to reclassify proposed Lots 2 and 3 as shown in trim document no. 18527/2014 as operational land and undertake the required public hearing in accordance with the Local Government Act 1993. 2 That Council lodge a development application for the proposed subdivision of Lot 8 DP 821952 as shown in trim document no. 18527/2014 with the necessary supporting information including environmental, bushfire and noise assessments. 3 That Council seek the assistance of an adjoining Council in undertaking the necessary public hearing and the assessment of the development application for the proposed subdivision. 4 That the proceeds of any land sale be invested in improving assets in Valla Beach and that the application of such funding be undertaken in consultation with the Valla Beach Community Association. Council has the option of retaining all of the land as “community land”. The slope and timbered nature of the proposed lot 3 is such that it is difficult to identify any public use other than its retention as a natural area. Council needs to weigh the opportunity cost of retaining such land against realising its value to invest in the renewal or improvement of its assets. 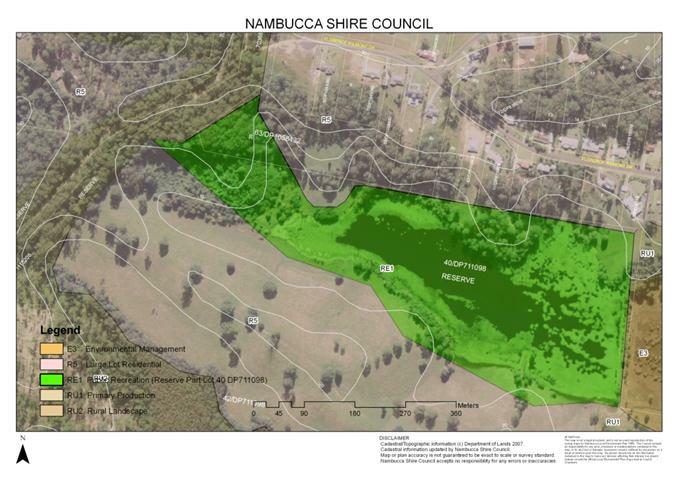 In 2012-2013 Nambucca Shire Council had an operating performance ratio of -33.0. The ratio measures a council’s achievement of containing expenditure within operating revenue. A deficit before capital occurs when total expenses are greater than total revenue (excluding all capital amounts). Even allowing for the transfer of the Macksville Showground, the ratio was still -11.2%, well below the TCorp benchmark of better than -4.0%. Given Council’s weak financial sustainability, as a general principle it is not recommended that Council retain land where no public use is identified or likely. A second option is that Council could undertake a residential subdivision of Lot 3 or both Lot 2 and Lot 3. The proposed reclassification and subdivision does not preclude this option at a later date if it is determined that a higher return is achievable with an acceptable risk. At Council’s meeting on 22 May 2014 it was resolved to obtain an assessment of the current market value of the land at Hyland Park and Valla Beach. Council’s major, largely “vacant” land holding at Valla Beach is the land containing the Valla Beach Pre-School and Valla Beach Hall. The land is Lot 8 DP 821952, 22 Valla Beach Road. It has an area of 1.89 hectares and is zoned Residential R1. The land and its zoning are shown on the attached zoning map. Pursuant to the Local Government Act, all of the land is classified as “community land”. As at the 1 July 2013 base date, Lot 8 DP 821952 had a value of $206,000. The value of the land had fallen from the previous valuation base date of 1 July 2010 when the assessed value was $266,000. The Pre-School and Hall sit towards the centre and eastern part of the land with the larger western section being forest. 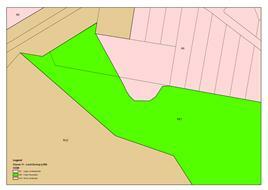 This is shown in the attached aerial/cadastral plan. A suggested subdivision of the land is attached which shows the Pre-School, Hall and existing car park being retained on the proposed Lot 1. The proposed Lot 2 comprises partly cleared land adjoining the existing car park and may be suitable for a future public purpose whilst the proposed Lot 3 comprises the forested land with no identified public purpose. The existing bus bay, which currently sits within Lot 8, should be incorporated in the road reservation. It is suggested that Council seek to reclassify the proposed Lots 2 and 3 from community to operational land and seek approval for the proposed subdivision. Should the reclassification and subdivision be approved, it is proposed that Lot 3 be sold and the proceeds of the sale be invested in improving assets in Valla Beach. The application of the funding would be undertaken in consultation with the Valla Beach Community Association. The proposed Lot 2 which adjoins the existing car park is likely to be suitable for a future public purpose and it is proposed that it be retained in Council ownership. Council will need to submit a flora and fauna assessment, bush fire assessment and noise assessment (for the railway line) as part of the development application for the proposed subdivision. There are no identified social issues. Any additional dwelling/s erected on the land will be of economic benefit to the Shire. Because the land is owned by Council, so as to minimise any concerns regarding potential conflict of interests, it is proposed that the assessment of the development application be undertaken by an employee of an adjoining council (preferred) or a consultant (less preferred) and that the application be determined by Council. Similarly the reclassification requires that the person presiding at the public hearing must not be a councillor or employee of Nambucca Shire Council (or a person who has been a councillor or employee within the past 5 years). It is similarly preferred that the person presiding over the public hearing be an employee of an adjoining council (preferred) or a consultant (less preferred). The Council must determine whether or not the reclassification proceeds following consideration of the report of the public hearing. The preparation of information to support the development application for the subdivision will cost in the vicinity of $10,000. If the development application for the subdivision is approved there will be costs in providing connections to services and contributions. Based on the 1 July 2013 valuation for the land, the proposed lot 3 should achieve a sale price in excess of $100,000. Neither the investigation costs nor the costs and revenue from any land sale have been included in the budget for 2014/15. Council will need to need to source the investigation costs for the subdivision from the property development reserve. There will be staff time required in the preparation of the development application and the management of the project. On 31 March 2010 the Council resolved to agree to a land exchange (swap) at Kingsworth Estate at nil consideration. At the time a valuation report, which Council had instructed be prepared, identified that the value of the land being transferred from Council was worth $25,000 more than the value of the land being transferred to Council. Notwithstanding Council resolved to agree to the land exchange with each parcel treated as equal value. The land has recently been sold and the new owners wish to complete the land exchange. Whilst there are reservations about the merits of the agreement, Council should honour its previous resolution which the new owners have acted on, with the exception that it is not agreed that Council should incur further “out of pocket” expenses through meeting its own legal costs. These should be met by the adjoining property owner. 1 That Council confirm its agreement to the land exchange between part Lot 40 DP 711098 and part Lot 63 DP 1058432 at nil consideration subject to the owner of Lot 63 DP 1058432 meeting all legal, survey and transfer costs, including any stamp duty which may be payable. 2 That Council’s seal be attached to documents relating to the land exchange as required. Council could seek the $25,000 consideration in its favour identified in the valuation report dated 4 January 2010. Council could also seek a new valuation at a cost of approximately $1,200. Council also has the option of changing its mind and not undertaking the land swap. The options are complicated by the fact that the land has recently been sold with settlement occurring on 8 April 2014. The new owners acquired the land knowing of and expecting the land swap to proceed. On 11 June 2014 a development application for the boundary adjustment/land swap was lodged by their surveyor, Amos & McDonald. A copy of the plan from the development application is attached. About 10 years ago the landowner of the adjacent property, Lot 63 DP 1058432, approached Council with a proposal for a boundary adjustment to enable a land swap between the Council reserve (Lot 40 DP 711098) and the rural residential land within Lot 63. In essence the land swap provided that an elevated, cleared section of land in Council’s ownership with a very desirable outlook over the large dam, be swapped for steeper, treed land adjoining Old Coast Road. The proposed land swap is shown on the following plan with Council giving the “white” coloured land from its Lot 40 and receiving the “green” coloured land from Lot 63. The western end of Florence Wilmont Drive can be seen at the top of the aerial photo. The Council proceeded to rezone and reclassify the land to facilitate the land swap. Bennell & Associates undertook the public hearing into the reclassification of the “white” section of Lot 40 from community to operational land. The change in zoning and classification to facilitate the land swap is shown in the following second plan with the land to be given by Council being rezoned R5 Large Lot Residential and the land to be received by Council being rezoned RE1 Public Recreation. A more detailed zoning map is attached. In the report on the reclassification, Bennell & Associates recommended that Council could proceed with the reclassification and rezoning subject to a property valuation of the land to be exchanged being undertaken. The recommendation to obtain a valuation was adopted by Council at its meeting on 5 February 2009. A valuation report was then obtained from North Coast Valuation Service. The report dated 4 January 2010 identified consideration payable as a result of the land swap from the registered proprietors of Lot 63 to Nambucca Shire Council to be $25,000, ie the difference in value between the land being swapped required a payment to Council of $25,000. Council considered the valuation difference at its meeting on 31 March 2010 and notwithstanding the valuer’s recommendation, resolved that Council agree to the land exchange with each parcel treated as equal value, ie that the payment of $25,000 from the property owner to Council not occur. “The original intention was a land swap with no payment as both parties benefited from the arrangement. Council needs this land to enable a useable access to the reserve to be created and should proceed on the basis of a land exchange at equal value. Each party can meet their own legal costs”. The report also noted that access to the dam was required for emergency drought situations to collect water for roadworks. The merits of the land swap and particularly waiving the consideration of $25,000 are questioned. More broadly it is questioned whether there is any rationale for Council to own Lot 40 which contains the dam. Whilst the land is zoned RE1 Public Recreation it has no constructed access and to provide for this and the necessary amenities for the area to be used for public recreation will cost the Council upwards of $200,000. There will also be costs to Council in managing the land as well as being responsible for all of the risks associated with owning a large water body. By any measure the Council has a significant over supply of land for public recreation and has neither the funds for the necessary capital expenditure to make the area useable nor the funds to maintain it. The future of Council’s land (Lot 40) is the subject of another report in this business paper. In relation to the land swap, in the circumstances that the new owners have acquired the land knowing of and expecting the land swap to proceed, Council should honour the resolved agreement. However in the circumstances that the available evidence indicates the owners are receiving a significant valuation benefit, it is not agreed that Council should incur any further “out of pocket” expenses. Therefore the owners of Lot 63 should meet all legal, survey and transfer costs, including any stamp duty which may be payable. There has been consultation with the new owners of Lot 63, with the Mayor and Council’s Senior Town Planner. The matter has been discussed at the weekly review of outstanding development applications with the Manager Development & Environment, the Manager Technical Services, the Strategic Planner and Senior Health and Building Surveyor. The risks are outlined in the report. The Council has already agreed to the land swap on particular terms. The new owner of the adjoining Lot 63 has purchased the land knowing of the agreed land swap and expecting it to proceed. Council has already incurred a significant cost in terms of staff time and consultants reports in the rezoning and reclassification of the land the subject of the boundary adjustment. If the boundary adjustment does not proceed, there will have to be a further commitment of staff time in rezoning that section of Lot 63 which is now zoned RE1 Public Recreation. This zoning is not appropriate for privately owned land. The Council would need to return it to its former zoning being R5 Large Lot Residential, the same zoning for the privately owned land in the Kingsworth Estate. Council is the owner of 17.6 hectares of land being Lot 40 DP 711098 which is zoned RE1 Public Recreation. The land adjoins the Kingsworth Estate and contains a large dam. The land has no constructed access and has not been developed for public recreation since it came into Council’s ownership as a developer contribution in the mid 1990’s. The reserve is not well located to a population centre. The available evidence suggests that Council has a surplus of publicly owned open space. Besides the questionable value in retaining the land for public recreation, the Council has not, nor is ever likely to have the necessary funds to develop and maintain the land for public recreation. It is recommended that the land be reclassified to operational and be rezoned for a low intensity use and then be sold with the funds to be applied to maintaining Florence Wilmont Drive. 1 Publicly notify its intention to reclassify Lot 40 DP 711098 (the Kingsworth Lake Reserve excluding the proposed land swap) from community to operational land and secure the services of a staff member from an adjoining Council to undertake the necessary public hearing. 2 In conjunction with the reclassification in 1, support the preparation of a planning proposal to rezone Lot 40 DP 711098 (excluding the existing R5 zoned land) from RE1 Public Recreation to E3 Environmental Management with a 40 hectare minimum area requirement for subdivision. 3 Resolve that the proceeds of any sale of the residue of Lot 40 DP 711098 (after the land swap) be applied to the maintenance and reconstruction of Florence Wilmont Drive. Council has the option of taking no action or applying a different zoning. Consideration was given to applying the more restrictive, E2 Environmental Conservation Zone however it does not permit extensive agriculture (grazing) nor aquaculture. It is considered that some agricultural use of the land should be permitted to provide some income for the management of the land. Reference is made to the other report is this business paper concerning the proposed land exchange (swap) of part of the “Kingsworth Lake Reserve” with an adjoining property, Lot 63 DP 1058432. The land is zoned RE1 Public Recreation, except for a small area the subject of the proposed land swap which is zoned R5 Large Lot Residential. A plan of management for the land was prepared in January 2012 in accordance with a recommendation from a public hearing into a proposed land swap (elsewhere reported). The adopted plan of management for the land is attached. The land has no physical access for a vehicle. There is an access handle between Lots 5 and 6 Florence Wilmont Drive which is suitable for only pedestrian access. There is no constructed access off Old Coast Road. Given how close the dam sits to the boundaries of the property it is doubtful whether physical access can be provided around the perimeter of the dam. The preliminary observation of the consultant, Sue Suter who is undertaking the review of Council’s Community Facilities and Open Space Contribution Plan is that in general terms the Shire has an overabundance of public open space. In relation to this particular reserve Council will need to spend upwards of $200,000 to provide the necessary access and amenities to enable it to be used. Council will also incur costs in managing the reserve. Its relatively isolated location makes it more vulnerable to illegal dumping and vandalism. In addition the large dam presents other risks and costs, for example in relation to the management of aquatic weeds and the potential for drowning. The reserve is not well located to a population centre. Whilst it adjoins the Kingsworth Estate, a large lot residential subdivision, it is located approximately half way between the urban centres of Macksville and Nambucca Heads. Whilst the use of the very large dam on Lot 40 was considered in Council’s drought emergency planning for water supply, with the impending completion of the $54m 4,500 ML off river water storage at Bowraville it is no longer likely that dam will be required for emergency water supply. Besides the questionable value in retaining the land for public recreation, the Council does not, nor is ever likely to have the funds to develop and maintain the land for public recreation. Ø To provide for a limited range of development that does not have an adverse effect on those values. The proposed E3 Environmental Management zone provides for a limited range of permissible land uses which includes a dwelling house, extensive agriculture and aquaculture. The E3 Environmental Management zone is also consistent with the zoning of land immediately to the east. A zoning map showing the relationship of the land to surrounding holdings is attached. Assuming the land is reclassified and rezoned as recommended, it is proposed that the land be sold with the proceeds applied to the maintenance and reconstruction of Florence Wilmont Drive. There has been consultation with the new owners of Lot 63; with Council’s Senior Town Planner as well as with the Manager Development & Environment, the Manager Technical Services, the Strategic Planner, the Senior Health and Building Surveyor, the Assistant General Manager Engineering Services and the Business Development Manager. There will need to be environmental investigations to determine that a dwelling may be erected on the residue of Lot 40 (after the land swap). These investigations will need to include a bush fire and flora/fauna assessment. In order to ensure the privacy of neighbouring properties it is proposed that a dwelling envelope be fixed before the land is sold. The value of the land for public recreation is discussed in the report. The financial and other risks are detailed in the report. There is no provision in the budget for the necessary environmental investigations which will be required for the proposed rezoning. These will include a bush fire assessment and flora/fauna assessment. It is estimated that the cost of this work will be less than $10,000. This can be funded from the Property Development Reserve. Provision for this will need to be made in the next quarterly budget review. It is anticipated that the required public hearing for the reclassification could be undertaken by a staff member of an adjoining Council. The cost attached to this would be the offer of a reciprocal arrangement. This can be met within existing overheads so Council will not incur an expense. No provision has been made for any revenue from the sale of the land. This is unlikely to be achieved in this financial year. There will be staff time required in preparing and reporting on the planning proposal. The preparation of the necessary environmental investigations will also need to be managed. However the removal of the reserve from Council’s list of assets to maintain will over time result in a substantial reduction in Council’s service levels. This will far exceed the initial commitment of resources to reclassify and rezone the land. Council needs to weigh the opportunity cost of retaining such land against realising its value to invest in the renewal or improvement of its assets. In 2012-2013 Nambucca Shire Council had an operating performance ratio of -33.0. The ratio measures a council’s achievement of containing expenditure within operating revenue. A deficit before capital occurs when total expenses are greater than total revenue (excluding all capital amounts). Even allowing for the transfer of the Macksville Showground, the ratio was still -11.2%, well below the TCorp benchmark of better than -4.0%. Given Council’s weak financial sustainability, as a general principle it is not recommended that Council retain land where no public use is identified or likely.